You’ll be impressed by Scott Kelly’s latest achievement regardless of whether you’re a space nerd. The American astronaut has successfully grown the first ever flower beyond the earth’s stratosphere. 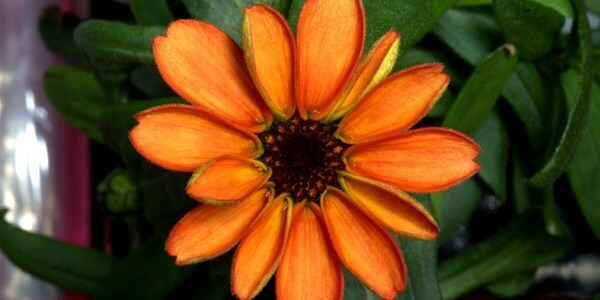 Over the weekend, Kelly tweeted a photo of the zinnia he cared for over the past month (seen above). The species was chosen because of its longer growth cycle and because it can help scientists understand how plants flower and grow in microgravity. It is more sensitive to environmental parameters and light characteristics. It has a longer growth duration between 60 and 80 days. Thus, it is a more difficult plant to grow, and allowing it to flower, along with the longer growth duration, makes it a good precursor to a tomato plant. Kelly’s colleagues on the International Space Station (ISS) began growing zinnias late last year, but were experiencing problems after only a couple of weeks. High humidity and low air flow caused the plants to leak water out of the tips of their leaves. Soon, mold began to form on the plants. When Kelly took over in the middle of December last year, he cut away the mold and made a few changes to the plans for caring for the zinnias. Kelly decided to ditch the instructions for watering the plants and began tending to them as he would his own garden back home. Soon, he had a zinnia flowering in all its orange glory. Both the successfully-grown flower as well as all those that died serve an important purpose: to allow us to learn how plants grow in space and to understand if we can cultivate crops on Mars. NASA will next attempt to grow Chinese cabbage and red romaine lettuce this year. In 2018, it plans to try its luck with dwarf tomatoes on board the ISS.